Sweet Remembrances........is located in a beautifully restored post Civil War era red brick row home in historic downtown Mechanicsburg, Pennsylvania, just fifteen minutes west of Harrisburg and less than two hours north of Washington, DC and Baltimore, MD. Proprietress and culinary artist Nancy Reppert opened this specialty business in 1990. Originally established as a private party place where afternoon tea, lunch and dinner were served specifically to groups, the tea room has expanded its service and is now serving Afternoon Tea on select Wednesdays (to any number of guests) and the first Saturday of each month, by advance reservation. Private groups are still entertained in this charming home-like atmosphere throughout the week, including weekends. Special activities, coordinated with The Rosemary House are scheduled throughout the year, including themed teas with featured speakers, holiday events, and a Fairy Festival in early September and a Tea Festival in late September. 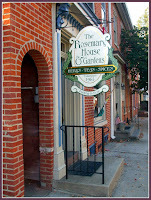 The Rosemary House...... located directly beside Sweet Remembrances is a herb and spice specialty shop that was established by Bertha P. Reppert in 1968 and is presently owned and operated by Susanna Reppert Brill. These two family businesses derived their names from rosemary, one of the oldest recorded herbs, it is also one of the most useful - for cooking, medicinally, in cosmetics, insecticides, and fragrances. In the language of flowers it is the symbol of remembrance and sacred to friendship. As Shakespeare said, "There's Rosemary, that's for remembrance". "The garden should be something without and beyond nature, a page from an old romance, a scene in fairyland, a gateway through which imagination, lifted above the somber realities of life, may pass into a world of dreams. 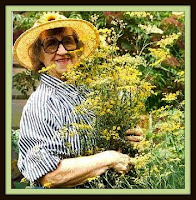 More than any other kind of garden does the herb garden lead us into a region of romance, of mystery and sweet remembrance, yet withal there is a common sense side to it whose usefulness is not to be denied."